Since Notre Dame’s founding in 1856, the world has changed dramatically, but our commitment to teaching young women “what they need to know for life” remains unchanged. Today’s Notre Dame graduates are strong, confident women who have the skills, knowledge, and confidence to succeed in the nation’s most competitive colleges and universities and who are prepared to take their place as leaders in a global society. Notre Dame students problem solve and think creatively; articulately express their opinions; and strive for excellence in the classroom, on the playing field, and as student leaders. With a 9:1 student to teacher ratio and a faculty that is passionate about their subject areas, Notre Dame celebrates the unique gifts of each student and inspires her to reach her full potential. 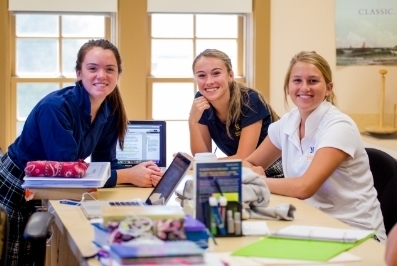 While challenging course offerings, including 19 AP classes, independent STEM research programs, and honors classes mark the Academy’s academic rigor, Notre Dame is a caring, spiritual community, guided by the faith tradition of the Catholic Church, the international service of Sisters of Notre Dame de Namur, and our Honor Code. President: Judith A. Dwyer, Ph.D.
Each student must earn a minimum of 24 units in order to graduate. In addition to meeting academic requirements, forty five (45) hours of social service are required for graduation. 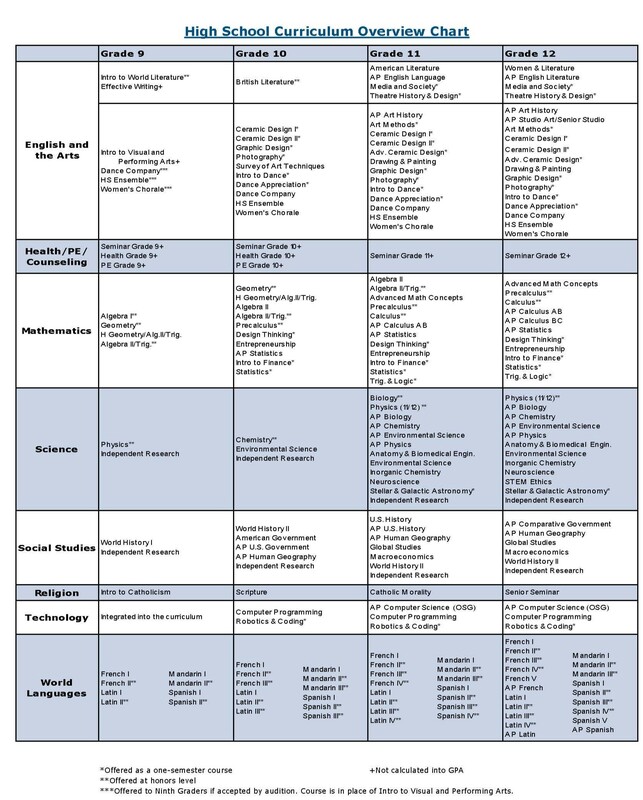 Notre Dame offers nineteen AP courses in six disciplines. 70 members of the class of 2019 took a total of 183 AP exams by the completion of their junior year. 78% of the scores were three or higher. Inclusion in the Academy of Notre Dame de Namur Chapter of the National Honor Society is offered to junior and senior students who have a cumulative grade point average of 3.90 for four semesters (juniors) or six semesters (seniors). To be included in NHS, students must also demonstrate leadership, scholarship, service and character, be active in at least three activities/sports, and live the spirit of the Honor Code. Learn more about the National Honor Society. Two students are selected by a faculty committee to take two courses each semester at a neighboring college during their senior year. Selection is based on the students' academic records, essay applications and two faculty recommendations.